Whether you’re traveling for business or fun or even catching a nap on the couch the AirMini makes it simple to bring your sleep therapy with you. Not only is it the world’s smallest CPAP, it’s also packed with proven ResMed technologies and features, like waterless humidification, designed to deliver a quality therapy experience anywhere you take it. In fact, more than 80% of users preferred AirMini over the two market-leading travel CPAPs in a recent study. And with the AirMini app, you receive your sleep score each morning and 30-day history, so you can continue tracking your sleep therapy anywhere. Settings on the AirMini can only be adjusted with the AirMini App. You can use the AirMini without the app but you will not be able to adjust the settings or review your CPAP use online. The AirMini comes set in Auto Mode with a pressure range of 4-20 cmH20. Smart Start is on. Ramp is on and set to auto. EPR is on only during ramp. Contact Easy Breathe to have your AirMini settings changed before it is shipped. It comes with the same therapy modes as ResMed AirSense 10 bedside devices (CPAP, AutoSet and AutoSet for Her). 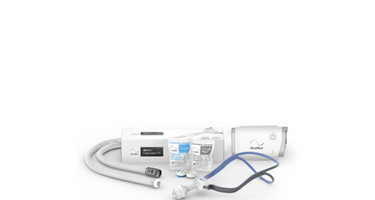 The same popular features are included AutoRamp, Expiratory Pressure Relief (EPR) and SmartStart. The AirMini app provides convenient control of your machine. Download it to your smart device for access to a range of adjustable comfort settings and your nightly score that tells you how well you slept.